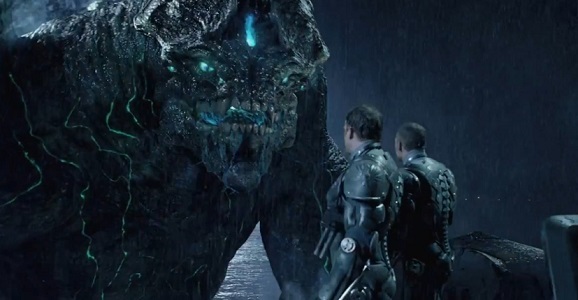 Guillermo del Toro’s giant robots versus mega monsters sequel Pacific Rim 2 won’t hit theaters for a few more years, but that doesn’t mean we’re not hungry for details, though they do seem rather unimportant in the grand scheme of things. As long as massive mechs battle nasty creatures with the enthusiasm of a small child loudly smashing toys together on a playground, we’re 100% on board. The landscape of the second film will reportedly be quite different, though some key pieces will remain in play. Talking to Collider while hyping up the impending Blu-ray release of The Strain, del Toro delivered a brief glimpse at what the world of Pacific Rim 2 will look like. In the wake of the first film, it’s a much more peaceful place, as after they closed the rift at the bottom of the ocean, the world’s giant monster problem went away. But then you have all of these skyscraper tall mechs to deal with, and what do you do with them? It’s a few years after the first one. It’s not an immediate follow-up. It is the world having been freed of Kaiju, what happens to the world after – what happens to the Jaeger technology once the Kaiju are not a threat. It’s quite a jump. Given the nature of the movie, you have to imagine this Kaiju free situation isn’t going to last all that long. They’re going to find a way back somehow, otherwise this is going to be a completely unexpected movie. We shouldn’t worry too much about that, however, as the Pan’s Labyrinth director has promised plenty of Kaiju action in the sequel, it just won’t be right out of the gate like the first one. Yes. It’s quite a different movie from the first one in that, but I think that two of our main characters like in the first one are Burn and Charlie. They are really, really – I mean, honestly, they are probably the guys I have the most fun writing along with Hannibal Chau so just from a purely selfish drive, I like writing them. I love writing for Charlie and Burn. I mean, [Burn’s] in Crimson Peak for that reason, because I love working with him. You’re gonna get a lot of that, but the Kaijus are very different and you’re gonna see a very different type of the robots I think. It’s gonna be quite a different adventure. This is all going to be interesting to watch play out. What are Geiszler and Gottlieb up to if they’re not studying Kaiju? What are Jaeger pilots like Raleigh and Mako up to? Are they just out of work and homeless? You kind of have to wonder if maybe, just maybe, it’s whatever project the two scientists cook up that brings the monsters back to our world. I can see them trying to work on something with totally altruistic motives, but have it backfire and screw everyone. Maybe they’re trying to find a way to look into the other dimension and see what the Kaiju are up to and they inadvertently wind up opening another portal. That’s certainly a possibility, but we’ll have to wait until April, 2017 to find out.